Since the economy has taken it's very ugly route, we, as a family have joined efforts to save energy, money and in turn, the environment. 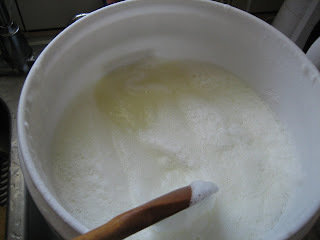 I found this recipe for laundry detergent from another blog and tried it out myself. The results were awesome!!! All you will need are a few easy to find ingredients. 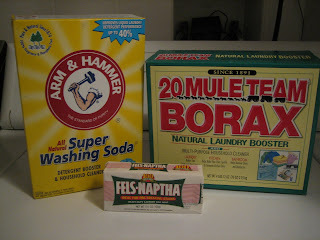 Pour the Borax and the Washing Soda into the 5-gallon bucket. 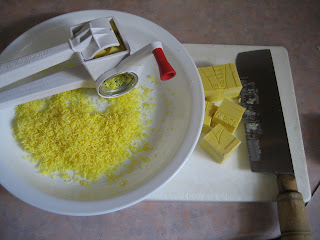 Using a cheese grater, grate the Fels Naptha soap completely on a plate. It will look exactly like cheese. 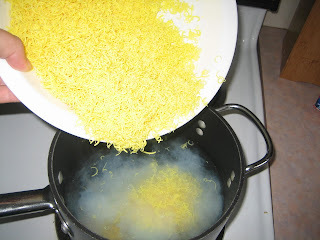 Fill a minimum 2 quart saucepan about 2/3 with water and add the cheese (soap). Heat on medium until the soap has dissolved completely. DO NOT walk away from this process. I can't even imagine what burning soap smells like and for how long. Add the hot soapy solution to the powder in the 5-gallon bucket. 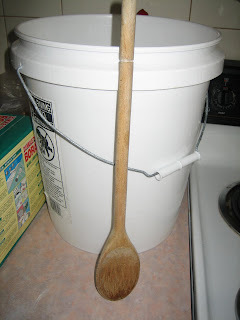 While stirring with the wooden spoon, add about 4 1/2 gallons of hot tap water leaving 4-5" of space from the top. Stir until powder is dissolved then leave overnight. Soap will turn to gel as it cools. Leave the wooden spoon with the soap for an occasional stir. The scent is very light. From reading about this detergent, it is like "Dreft" a very mild, hypo-alergenic soap. It does not leave any residue and my clothes have come out very clean. My whites are whiter than with store bought soap. You only need to use the same cap full as you did from previous containers. There are no suds like store bought, but you should know that suds are artificially added to commercial soaps, it doesn't do anything more but leave residue. If you like scented laundry, you can add essential oil to the detergent or fabric softener. Mix 1 tbsp of vinegar and water into a Downy Ball for the fabric softener. It actually breaks down previous soap and softener residues and leaves your towels soft and absorbent.